"Vox Populi, That's the Constitution"
A famed liberal-minded scholar stirs a controversy as his pro-democracy article titled "Vox Populi, That's the Constitution" is rejected from a local daily to which he has been contributing his weekly columns. Vox populi are Latin words meaning the "voice of the people." 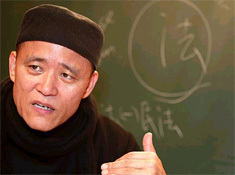 In a hastily called press conference on March 29, 2004, Do-ol Kim Yong-Ock, currently a chair professor of Choongang University, said he will sever all relations with Munhwa Ilbo, a local afternoon daily because the newspaper refused to run his weekly column "Do-ol Gosong" or "Do-ol's High Voice." 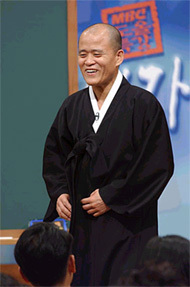 Professor Kim is better known for his pen name Do-ol. 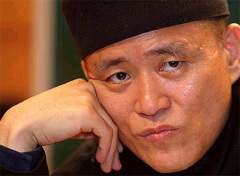 His television lecture on Korean and Asian classics is gaining huge popularity, yet his strong and harsh rhetoric against the "privileged conservatives" keep creating controversy and praise from people at the same time. Parts of Do-ol's article read "Korean people should rise up for democracy if evil forces harbor any sinister designs with the ruling of the Constitutional Court on President Roh Moo-Hyun's impeachment." The opposition-dominated National Assembly impeached liberal-minded President Roh Moo-Hyun on March 12, 2004 and the Constitutional Court of Korea is awaiting the final rule on the impeachment. A series of large-scale demonstrations have ensued since mainly conservative politicians against the will of general public passed the impeachment bill. "We should not calm down our anger over the collapse of justice by the impeachment," Do-ol intoned in his article. "Vox Populi now! That is the most important constitution. We have to rewrite our Constitution." Do-ol released the full text of his article to the press after the Munhwa Ilbo rejected his article. The daily was quoted as saying that it refused Do-ol's article because the article seriously runs counter to the newspaper's principle of fair editorial policy. He has been writing a column since September 2003. A local specialty newspaper covering the mass media field reported that Munhwa's sudden refusal seemed to have to do with a change of command at the newspaper company's top management. The Media Today said the new President, Lee Byung-Gyu, refused to run Do-ol's article in his presence. Munhwa's managing editor Kim Jong-Ho said Do-ol's articles are extremely lopsided (leftist). "It is almost impossible for us to run his article particularly because this new one is even stronger in its rhetoric and aggressiveness." Do-ol's recent articles have been quite controversial in that they are urging people to come out on the streets in support of democracy. Recent articles he has written since the impeachment are titled "Young People, Go Out on Streets!," and "It Is Time to Change Our Fate." Meanwhile, some of Munhwa's reporters expressed regrets that their newspaper cannot run liberal articles like Do-ol's because of the new editorial policies and principles set by the new management. Other reporters shrugged suggesting that Do-ol's writings are too weak in reasoning and far too agitative. This case shows clearly how South Korea's mainstream news media react to liberal articles like Do-ol's, even though news organizations in South Korea are now free to run whatever they want without interference or pressure from the government. Unlike the United States where most politicians complain about liberal bias of major dailies, Korea's mass media, particularly the three largest dailies so-called "Cho-Joong-Dong" or "Big Three" newspapers are quite conservative, thus very critical of or even aggressive against President Roh Moo-Hyun and his progressive liberal government. The following is an excerpt of Do-ol's writing "Vox Populi, That's the Constitution." which was to be run on Munhwa Ilbo's March 29, 2004 edition. Laws are not merely written words. Voice of the people, that's the constitution. Laws are the system of compromises agreed upon and are defined by the components of social groups. They are not only written laws but natural laws, as well. It is erroneous and narrow-minded to consider as law only written laws formed after the written laws of Europe during the Japanese colonial period (1910-1045). Particularly, constitutional laws should be based on from historical experience. Unlike American constitutions or Britain's unwritten laws, including the Magna Carta (Great Charter) and Bill of Rights, our constitution was made and promulgated hurriedly by several members of legislators on July 17, 1948. In the cases of America and Britain they earned and expanded their rights by even shedding blood. 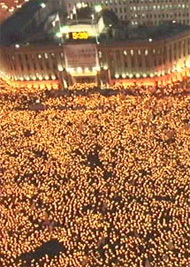 Tens of thousands of people are clamoring for nullification of the impeachment in vigil light protests on March 14, 2004 in front of Seoul City Hall. We have achieved our democracy by fighting the dictatorship and tyranny. Our ancestors and seniors also shed blood during the past decades for the pro-democracy movement. We should not allow our hard-earned democracy to crumble. We cannot have nine interpreters of the law (justices of the Constitutional Court of Korea) decide our destiny. I dare to say we are faced with the biggest constitutional crisis since the founding of our country. Korean people should rise up for democracy if evil forces harbor any sinister design as with the ruling of Constitutional Court on President Roh Moo-Hyun's impeachment. If undemocratic (evil) forces disguise their sinister design as a "sweet" talking of "let's be quiet and wait for Constitutional Court's ruling," Korean people should rise up for democracy. Their reckless axes will chop the buds off of our fledgling democracy. They manipulate our constitution from our lives completely. We should not give in to their rhetoric that "let's be quiet until the final ruling of the Constitutional Court." We should voice our anger over social injustice created by lawmakers who passed the impeachment bill against the will of the people. Right now, at this point, we must rely on our people's voice (vox populai)! That is more important than any other constitution! We should rewrite our constitution! Come on out on the shining plaza and recite parts of King Crimson's "Epitaph." If no one sets the rules.